The Philbrook Museum of Art is a gift to our community and is meant to last for generations. In order to preserve these fine works of art and the facility itself for future visitors, we kindly ask that you follow these guidelines during your visit. Touch with your eyes. All parts of the body should remain at least two feet away from the works of art. It is acceptable to “touch” with your eyes, but not with your hands (this includes walls, labels, display cases, and pedestals). Listen to the docent. If you talk while the docent is speaking, other people won’t be able to hear. If you have questions or comments, raise your hand and the docent will call on you. Stay in your group. Walk quietly only (no running, please) on the stairs, or through the galleries. Use inside voices in all areas so that other visitors can enjoy the museum. Steer clear of elevators and revolving doors. This allows your docent guide to better manage the group. Unintentional damage may result from gesturing too close to a work of art and the natural oils on human hands can cause serious damage over time. Fingers placed on the surface of a picture can easily damage the paint layer or the canvas; a hand brushed against sculpture may leave a damaging trace of acidic perspiration. Please be careful—artworks, like people, are unique and irreplaceable. Due to restrictions accompanying loaned artworks, photography may or may not permitted in the Helmerich Exhibition Gallery, signage will be posted near artworks which may not be photographed. Non-flash, hand-held cameras are permitted in Villa Philbrook and Gardens. Keep participants together at all times. It is the responsibility of the chaperone not only to stay with the group but also to keep the visitors together. When in small groups, please encourage the participants to ask questions. Please remember to refrain from answering questions that are intended for the students. A good chaperone needs to remind the participants of museum etiquette and follow them as well. Groups are asked to leave coats, backpacks, umbrellas, lunches, and packages in their cars or buses, as checkroom facilities are limited. Have a question? We’re here to help. Call us at 918-748-5300 or email GuestExperience@Philbrook.org. You can also visit us at the admissions desk during regular Museum hours. Please, no food and drink. No running and yelling. You never know what’s around the corner. Phone calls should be taken outside of the gallery. Speakerphone is not permitted. Take all the photos you want, but no flash photography, please. Photography equipment, including but not limited to tripods, monopods, and selfie sticks are not permitted. No pens, markers, paints, charcoals, pastels, or solvents. Children under the age of 13 must be accompanied by an adult. Bags larger than a standard backpack should be left at home, in your vehicle, or in our coat closet. Standard backpacks and bags should be worn on one shoulder while visiting the galleries. Small lockers are available for checking items. Call 918-748-5300 for more information. Strollers are allowed in the galleries and gardens. For the safety of all visitors and to protect the art, children may not be carried on the back or shoulders of an adult. Child carriers that attach to the front are permitted. 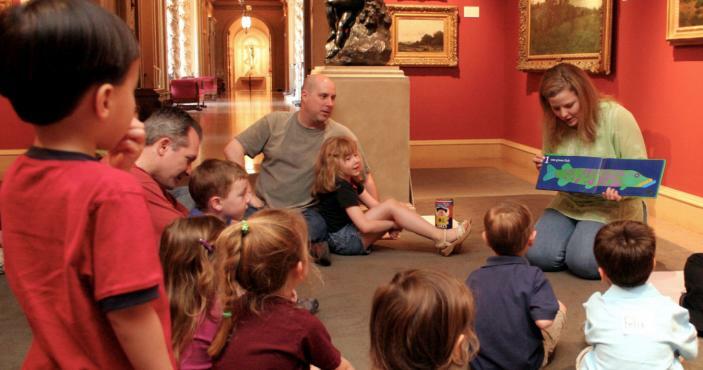 Museum visits should be fun, enjoyable experiences for everyone. Take a minute to review our school group guidelines before your visit, and please remind your group to follow them during your time at Philbrook. While you can’t eat and drink (or even chew gum) in the galleries, we have a lovely restaurant that serves lunch, and dinner on Friday night. Here’s a menu (link). In addition, you may picnic in our beautiful gardens. Please limit phone conversations to non-gallery spaces, lobbies, the restaurant, and outside. If you are using your phone to participate in an audio tour, please use headphones or earbuds. Earbuds are available at the admissions desk. Pets and therapy animals are not permitted in our galleries, gardens, or grounds. Service animals are permitted. Philbrook makes for a wonderful backdrop! If you wish to schedule a photo session (portrait, group, bridal, engagement, prom, etc. ), please follow these steps or contact Guest Experience at 918-748-5300 in advance of your visit for more information. Photography of specific artworks and/or entire exhibitions may be prohibited. Visit our admissions desk or call us at 918-748-5300 for details. Submit a written proposal at least 10 days prior to the proposed photography or filming date. Show a valid student ID upon check-in. Artists are permitted to sketch with pencil in the galleries. Pen, markers, charcoal, pastels, and wet media are not permitted in the galleries. Artists are welcome to draw and paint in our gardens. Please review our Artist Guidelines before your arrival. Philbrook is smoke-free, drug-free, and nicotine-free. Electronic cigarettes and vaporizers are not permitted. Possession of dangerous materials, including weapons and firearms, is not permitted.